Bird song playback as a tool should exist only to help the cause of ornithology and science, not to help photographers become social media sensations, or for birdwatchers to win the 'big year'. Are you a birder/photographer who treats birds with respect by not using playback? 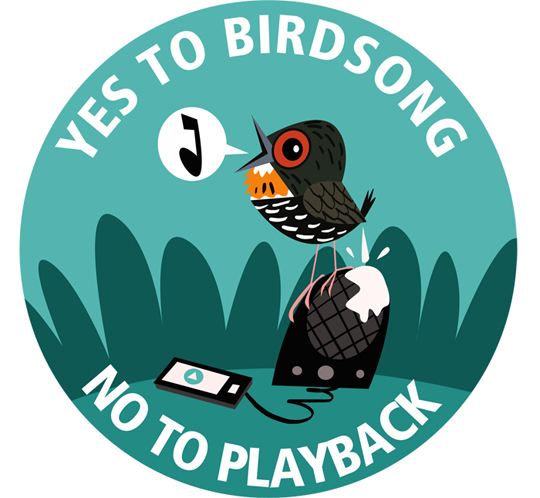 Now you can proudly wear your 'No to Playback' badges and t-shirts and let your peers know that you're an ethical birder. For orders outside of India, visit my webstore here. (The bird in the illustration is a Mishmi Wren Babbler, an IUCN Vulnerable species endemic to Dibang Valley in Arunachal Pradesh, North-east India, that is serially hounded by photographers and birders who use playback).